2 Great Days of Entertainment for the Whole Family! 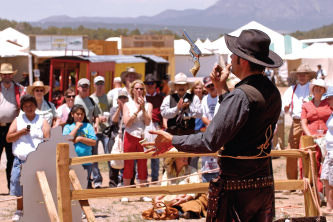 Vendors & Exhibitors, Live Music and Stage Shows, Mounted Shooting Exhibitions, Riding Longhorns, Horse Parades, Shooting Gallery, World Championship Shooting Competitions, Pet & Horse Adoptions, Gatling Gun Outpost, Living History Encampments, Great Food, Shopping & Fun! Bring your Sunglasses! Eye Protection is mandatory for public spectators entering onto the shooting range/competition area. Hearing protection is recommended as well, and available on-site. 8:00 AM - 5:00 PM END of TRAIL Exhibitors, Encampments & Vendors Open! 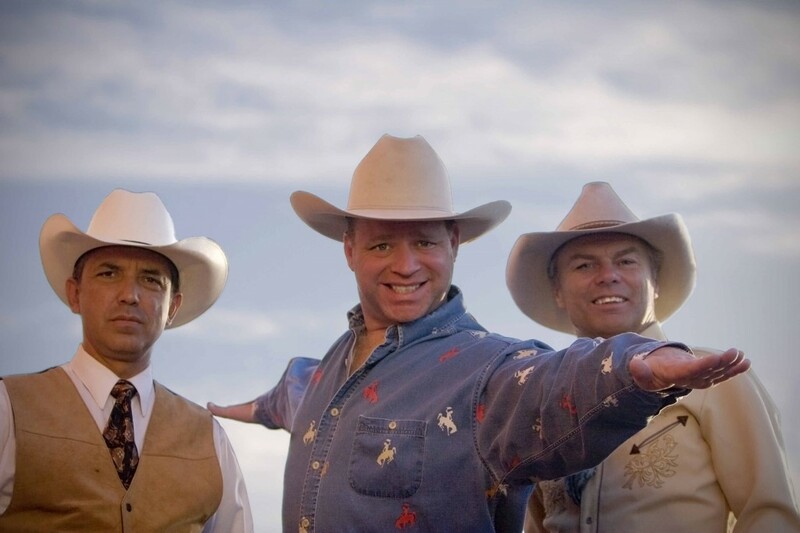 The Sons of the Rio Grande formed as a trio in 1996 in the Rio Grande valley of central New Mexico. They are a stirring combination of tight trio harmony and lively instrumental work that will evoke the original Sons of the Pioneers, building on that excellent tradition with material spanning a century of Western music, including severl original compositions from founding members Walen Mickey, Rob Croft, and Larry Ruebush. The title track of their debut album, Rob's song The Spirit & Beauty of the West, won the New Mexico Music Industry Award for best folk song of 2004. 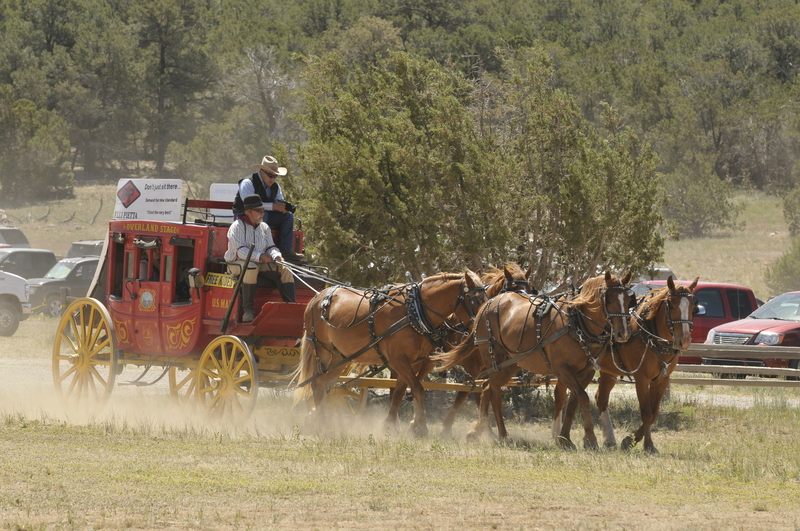 3 Stage World Championship Mounted Shooting Stages, World Speed contest, Mounted Rifle Rivalry- all followed by a Mounted Parade through Founders Ranch town in the afternoon. Don Bullis graduated from Eastern New Mexico University in 1970 with a bachelor's degree in American History and American Literature. 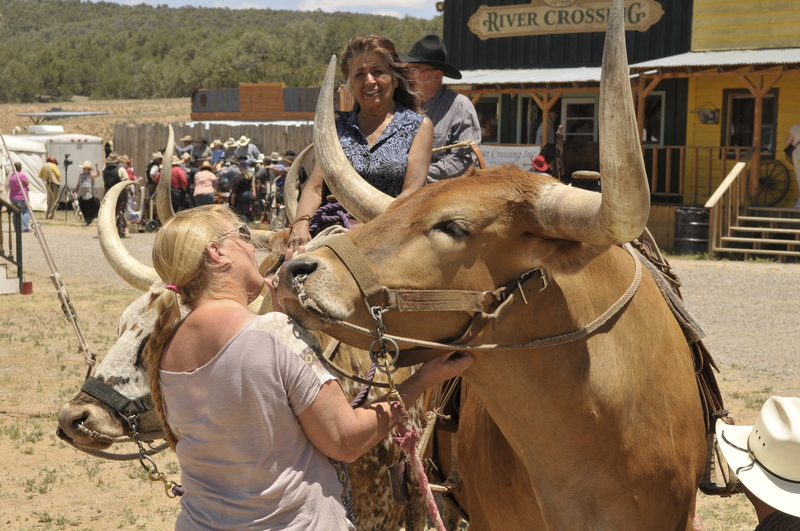 Bullis is Past Sheriff of the Albuquerque Corral of Westerners International. He is a member of the Sandoval County Historical Society, Albuquerque Historical Society, Western Writers of America, the Western History Association, National Association for Outlaw and Lawman History, Southwest Writers, The New Mexico Book Co-op, and the ENMU Alumni Association. Mr. Bullis is the Author of ten non-fiction books and two novels. They are New Mexico's Finest: Peace Officers Killed in the Line of Duty, 1847-1999 and 99 New Mexicans...and a few other folks (2005), Bloodville (2002) and Bull's Eye (2006), Unsolved! (2013) New Mexico Historical Biographies, Duels, Gunfights and Shootouts, The Revised Old West Trivia Book, New Mexico and Politicians of the Past. 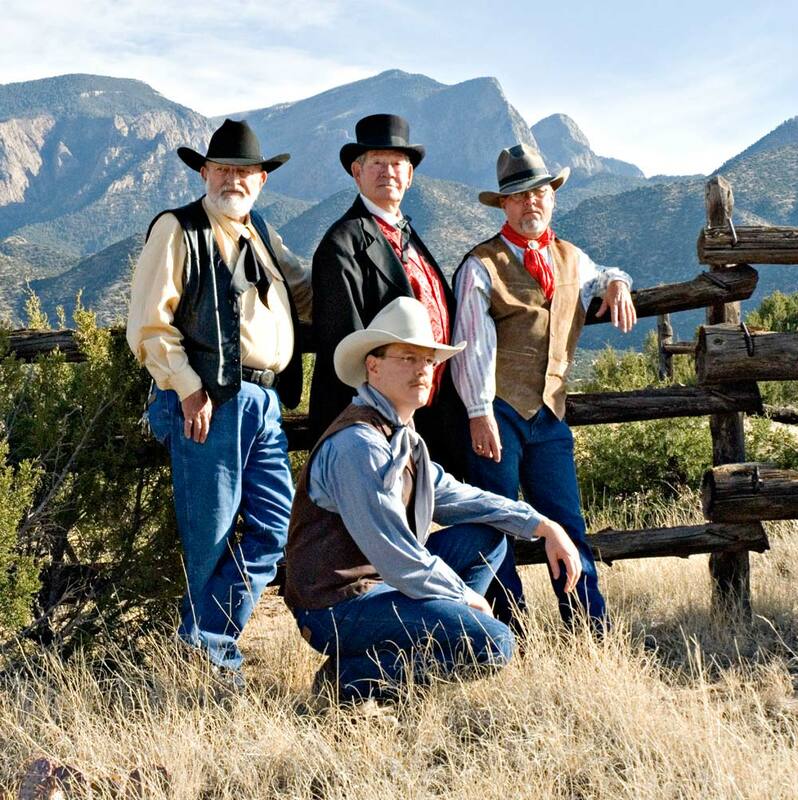 Syd Masters is an award winning singer and songwriter of traditional western music. He takes pride in doing his part in keeping the modern and old west alive through vintage cowboy music and songwriting. Syd is the author and recording artist of The Official State Song of New Mexico and the 2012 AWA Male Vocalist of the Year. The Western Music Association, Academy of Western Artists and The New Mexico Music Industry have combined to nominate him for more than 40 awards over the past 15 years. “Vocalist of the Year,” “Country Song of the Year,” “Best Album,” Best Band,” Most Humorous Song,” and “Best Song” are some of the categories in which he was victorious. He and his Swing Riders are a multi-talented, thoroughly funny, hard touring, high energy cowboy band out to save vintage western music one two-step at a time! You don't want to miss this truly memorable spectacle for all ages! END of TRAIL is proud to welcome Professor Farquar's Great American Medicine Show- presented by the celebrated Mountebank Professor Farquar with a most entertaining program of Music, Magic & Mirth, and featuring the delightful talents of Miss Polecat Annie. This unique attraction includes Historic narratives, comic chronicles, tall tales and unabashed balderdash. Toe-tapping tunes, bucolic ballads, lyrical laments and droll ditties of the Union and Confederacy. Astonishing and magnificent illusions, mysteries and feats of chicanery. A necromantic exposition so enigmatic, it is surely the envy of Mephistopheles himself! Hands-on instruction in card sharping, sleight of hand, old time amusements and games of skill. Absolutely fabulous Victorian face painting, Palmistry and aura reading, and an enlightening dissertation on Farquar's Elixir of Life; the Marvel of the Ages! 5:00 PM Event Closes to the Public - THANK YOU for Coming! 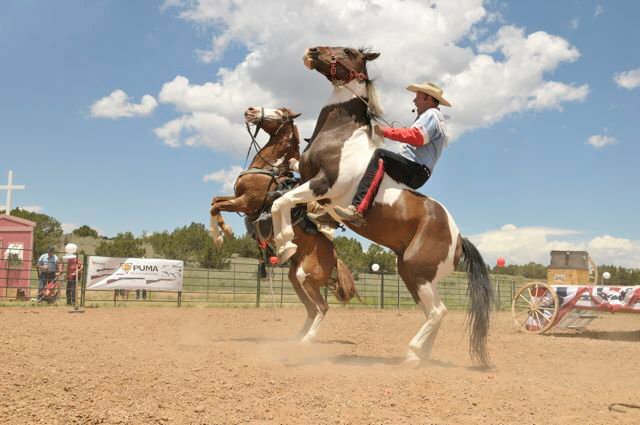 3 Stage World Championship Mounted Shooting Stages, Mounted Shotgun Shoot-off, Quick Draw Duel, and Extreme Team Contest- all followed by a Mounted Parade through Founders Ranch town in the afternoon. Interstate 40 East from Albuquerque (22 Miles from Interstate 25). Exit Sedillo, head east on route 66 to highway 217, turn right (south) and continue 4 miles to Juan Tomas Road. Turn left on Juan Tomas and continue 1.5 miles to Barton Road. 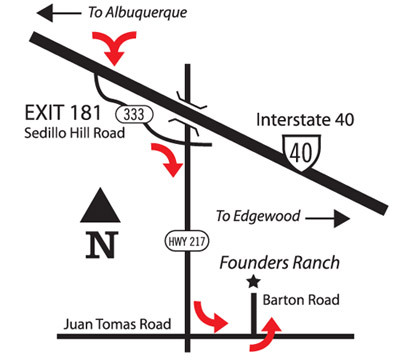 Take a Left on Barton Road and proceed ¾ mile to participant gate at the Founders Ranch Entrance. SEE YOU AT END OF TRAIL!